Made of high-impact polystyrene with extra-wide cash trays, the Duralite Large Replacement Cash Tray accommodates foreign currency. The spring-loaded bill weights keep currency secure while the round-bottom coin trays allow for easy scooping. It features a disc tumbler safety locking cover to safeguard contents during transport. 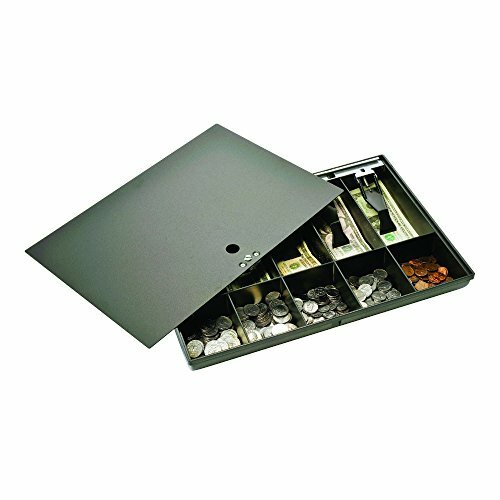 This cash tray is the perfect replacement tray for most cash drawers found in retail stores, banks, and currency exchanges. Black. Measures 16.7 x 11.7 x 2.7 inches. If you have any questions about this product by Duralite, contact us by completing and submitting the form below. If you are looking for a specif part number, please include it with your message.